Moscow City Ballet, Nottingham Royal Concert Hall. 7-10th Feb 2018 – East Midlands Theatre. Welcome to East Midlands Theatre. Click for more details. Renowned dance company, Moscow City Ballet, returns to the UK following a triumphant season with its dramatic traditional story-telling and captivating performances, appearing at the Royal Concert Hall Nottingham from Wednesday 7 to Saturday 10 February 2018. Moscow City Ballet reaches the UK on the back of another jubilant worldwide tour where it reaffirmed its popularity with thousands of dance fans. 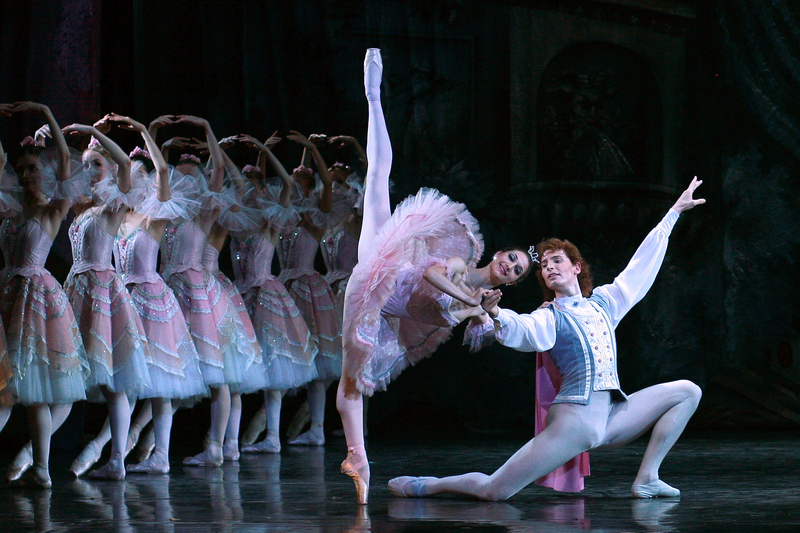 The company’s dazzling repertoire of full scale ballet classics – Swan Lake, Romeo and Juliet, The Nutcracker and The Sleeping Beauty – emphasise the fact that Russian ‘big story’ ballets combine artistry, technique, narrative and live music, thus providing a true dancing experience. Audiences can only marvel at the perfection of its corps de ballet and witness the excellent dexterity and grace of principal ballerinas Alevtina Lapshina and Liliya Oryekhova. The enchanting and romantic story of The Sleeping Beauty inspired Tchaikovsky to write some of his most glorious music, and the ballet has captivated the imaginations of people for well over a hundred years. Featuring the delicate Princess Aurora, her gallant Prince, the beautiful Lilac Fairy and a host of fairy-tale characters, this is a truly magical production. The world’s most famous love story Romeo and Juliet is set to Prokofiev’s dramatic score, a masterpiece of 20th century music. All the hustle and bustle of Renaissance Verona is brought to life in this powerful production. The ballet follows the fate of the star-crossed teenage lovers from their first meeting to their untimely and tragic death. Live music is at the heart of Moscow City Ballet’s productions and both Prokofiev’s and Tchaikovsky’s masterpiece scores are played beautifully by the Moscow City Ballet Orchestra adding an extra dimension of drama and splendour. Founded by Victor Smirnov-Golovanov in 1988, Moscow City Ballet is one of Russia’s most successful and popular touring ballet companies, highly admired for its distinctive style, exciting choreography and exceptionally gifted dancers. Under the artistic direction of LudmilaNeroubashchenko, who has been leading the ballet company for the last few years, will now officially take on the position of Artistic Director and will continue to preserve Victor’s unique choreography and productions as well as the commitment to promoting ballet in the Russian Classical tradition all over the world. We are looking forward to a successful 25th Anniversary Season of 2013-2014. Neroubashchenko the company continues to be committed to promoting ballet in the Russian classical tradition to audiences all over the world. These unique productions still continue the legacy of the distinctive choreography created by Victor Smirnov-Golovanov. Hairspray the Musical UK tour. Norman Pace to star as Wilbur Turnblad. Promo: The Wedding Singer by The Mellow Dramatics. Review: Motown The Musical (touring). Nottingham Theatre Royal.